ec. Siemensvilla, Berlin-Lankwitz, Germany, December 10, 12, 14-15, 2009, 6 August 2010 (12 Miniatures). The wait for the music of a particular composer to be recorded when they have been ill-served in the past is sometimes a long one. In the case of Weinberg it seems as if his time has finally come and new discs of his music are arriving fairly regularly. This is the fourth CD of his music that I’ve reviewed. I know they’ve been others recently, and Amazon now lists over 60. It is great news and if, like me you’ve also found his music to be to your liking then, again like me, you’ll welcome this addition as much as I do. What has emerged as the CDs arrive is what an amazingly rounded composer he was with compositions in almost every genre. Weinberg composed 26 symphonies, seven concertos, 17 string quartets, 28 sonatas for various instruments, seven operas, several ballets, incidental music for 65 films, and many other works, including a Requiem. When Shostakovich received the score of his First Symphony in the post asking him to look at it, he was so impressed he immediately arranged for Weinberg to come to Moscow from Tashkent where he had gone to escape the invading Nazi armies. The two composers became fast friends. While there is no doubt that Weinberg was influenced by Shostakovich, the same was also true the other way round, with each acknowledging the debt to the other. The music on this disc confirms Weinberg’s enormous creative talent and often unique musical view. One of the biggest difficulties I find in writing reviews is how to describe music I enjoy in different ways. This disc is a case in point as what’s on offer here is so thoroughly impressive and it’s all too easy to find that I’m repeating myself while I struggle to find words to express how marvellous I find the music. With this firmly in mind I’ll do my best to try because this music deserves no less. Right from the very first note you know you’re in for something special. The mellifluous tone of the beautifully played clarinet wafts in as if on a breeze while waiting for its piano accompaniment. It’s not long before you can hear why people refer to Shostakovich when writing about the music of Weinberg. Indeed the booklet notes the considerable influence the older composer had on the younger man who wrote both the clarinet sonata and the twelve miniatures in 1945, just two years after arriving in Moscow at Shostakovich’s behest. The second and third movements may also remind one of Shostakovich. That is mainly because the Jewish folk tunes Weinberg based much of the material on are sources that Shostakovich also drew on, sources that he used, with Weinberg’s help, in his From Jewish Folk Poetry (1948). The writing is witty and satirical. Weinberg’s scoring for clarinet reflects its use in much of the klezmer music that had been written since the nineteenth century in which the clarinet was steadily replacing the violin. Music like this was in Weinberg’s very bones since his father was a composer and violinist in a travelling Jewish theatre. There should be no surprise that it should feature so recognisably in his music. It is hard to imagine how he could write such happy sounding music when only four years earlier, before fleeing first to Minsk then to Tashkent, the Nazis had burned alive his entire family. This is not to say that the music does not have a dark side too. The end of the sonata is tinged with sadness but it is optimism that I see as winning through. The Twelve Miniatures for Flute and Piano Op.29 opens with a tune that not only doesn’t sound like Weinberg, but sounds French to me rather than Russian which only shows this composer cannot be pigeonholed. The second has him back firmly where you expect with a wistful little waltz, marked Arietta, while the third is a merry Burlesque,followed by a comic Capriccio. Various other moods are represented but the main feature throughout is the brilliance of these little character pieces that charm and delight in equal measure and conclude with a really lovely Pastorale. Weinberg’s sonata for solo bassoon shows his continued search for expression in music and his willingness to write for less usual instruments: his Op.108 is for solo double bass. There are very few composers that have tackled any music for solo bassoon and those that have such as Willson Osborne, Malcolm Arnold, Gordon Jacob and Karl-Heinz Stockhausen - whose piece In Freundschaft was originally written for bass clarinet and has been adapted for various other instruments - kept their works fairly short. 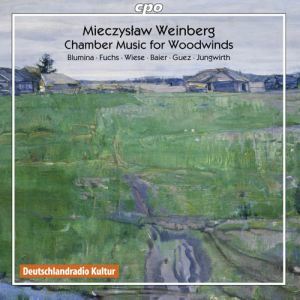 Weinberg’s composition is a substantial one of four movements and a total length of over 21 minutes. Incidentally readers would no doubt enjoy a YouTube presentation of Stephanie Patterson playing the Stockhausen work dressed as a teddy bear which is Stockhausen’s wish fulfilled at last! Weinberg’s Bassoon Sonata from 1981 really tests the prowess of the soloist and the writing reveals an instrument capable of great beauty rescuing it from the denizens of the woodwind section where its abilities are usually confined to helping provide a background. Matthias Baier’s playing is simply superb and the piece could find no greater performer to emphasise its wonderfully melodious nature. The final work on this disc is the Trio for Flute, Viola and Harp which dates from 1979 and is yet another surprise that recalls Debussy’s late work for the same three instruments. This begins with a meditative theme on flute and viola before the harp joins in to weave its version into the fabric already established. The second movement is slow to begin with but its warm viola introduction is disturbed by trilling from the flute mirrored in the harp though calm is soon restored. The three share a lovely melody between them for a short while before a more intensive and insistent mood is created. This leads into the final movement which, though short, is more anxious in tone and powerful in execution. It ends in a final eruption from all three. While it is self-evident that the more often any music is heard the more one gets from it there is an immediate appeal in the music on this disc. That’s something I’ve found with all of this composer’s works that I’ve heard so far. It’s a facility that should help in establishing his reputation still further and secure his place as, what many musicologists declare, the third great composer of the Soviet era after Shostakovich and Prokofiev. Weinberg often wrote music that contained satire and wit but that lacked the sardonic even mordant nature of much of Shostakovich’s works. Here was a man who, despite the terrifying experiences in his life that included spending some months in prison under Stalin, still managed to reflect hope and optimism in his music. This disc is another fitting tribute to a composer whose works are finally emerging to enrapture new and wider audiences. The musicians on this disc have made a significant contribution to the process, all of them turning in performances of beauty and great skill. Elisaveta Blumina deserves special plaudits for her pioneering work on behalf of Weinberg; her disc of his Piano Works on CPO 777 517-2 is another great example. More please!